I don't know about you, but in our house we use batteries like we use toilet paper...A LOT!!!! :) It seems like every. single. children's. toy. requires batteries....lots and lots of batteries! And of course, for my son's birthday a couple weeks ago, we got him some new toys...and what do they require? Batteries!!! 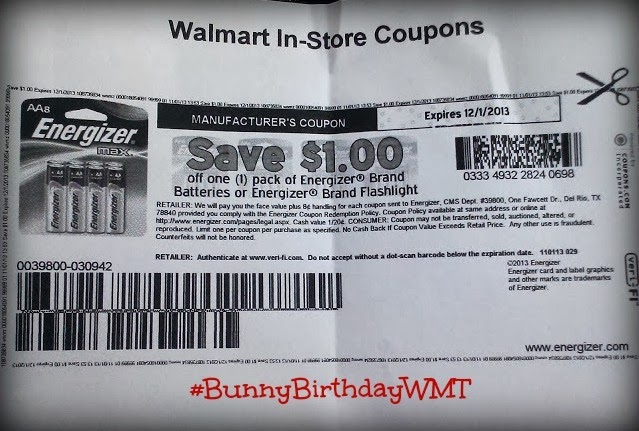 So you can imagine how happy I was when I found out that it is also Energizer Bunny's 25th birthday and they are celebrating by offering a $10 Walmart gift card when you purchase 2 packs of specially marked Energizer Max batteries at Walmart! I get a gift card for buying something I need anyway - I love that! In addition, there is a new coupon to make this an even better deal. One coupon is available in the inserts from the 10/27 newspapers. If you do not have that coupon, NO FEAR - there is a digital coupon on Walmart.com and coupons.com for $1.00 off MAX AA 8pack or larger. That is where I got mine! It was super easy to print and it saved me money! Love that! 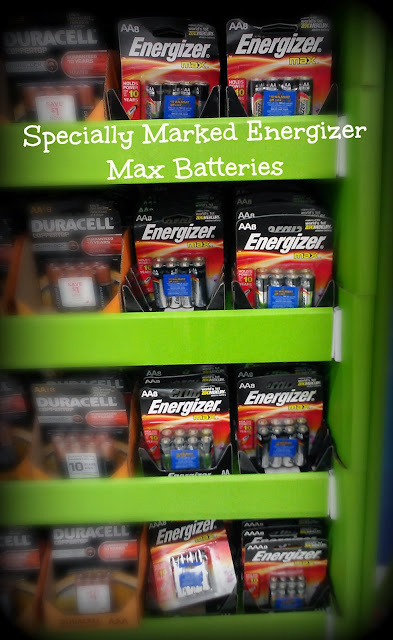 So with my coupon in hand, I headed to my local Walmart in Apple Valley, MN and found the specially marked Energizer Max batteries in the Electronics section on a special display stand! They were really easy to spot and really easy to find! So thankful for that...especially when shopping with two toddlers! There they were...every size Energizer Max batteries with the special blue $10 Walmart gift card sticker on them! Then came the hard part...deciding on which batteries we needed for all the toys that needed batteries, especially my son's newest birthday presents! 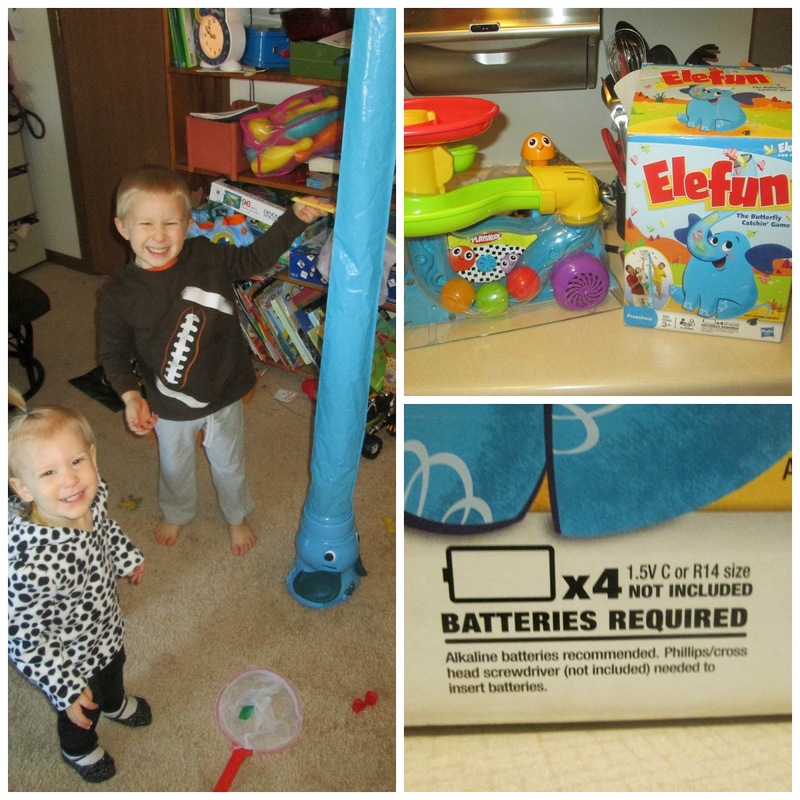 We decided on the C and D Energizer Max batteries because we never seem to have those around when we need them and my son's newest toys require them. My son (and daughter!) was very excited to finally be able to play with his new toys! When I opened our battery drawer to put the extra batteries away, I noticed that Energizer is definitely the choice of battery in our house. Looking at our battery selection, all I see is the Energizer Bunny and the classic black and silver Energizer colors! They power all my children's toys, birthday after birthday and I am so happy to help them celebrate their 25th Birthday!!! Best of all, I get a $10 Walmart gift card to buy more batteries or new toys for my children for Christmas!! So don't forget to head to your nearest Walmart, wish Energizer a Happy 25th Birthday by buying some of their Energizer Max batteries, and cash in on an easy to get $10 Walmart Gift Card while buying quality batteries for your children's toys, your husband's electronics, or your accessories! 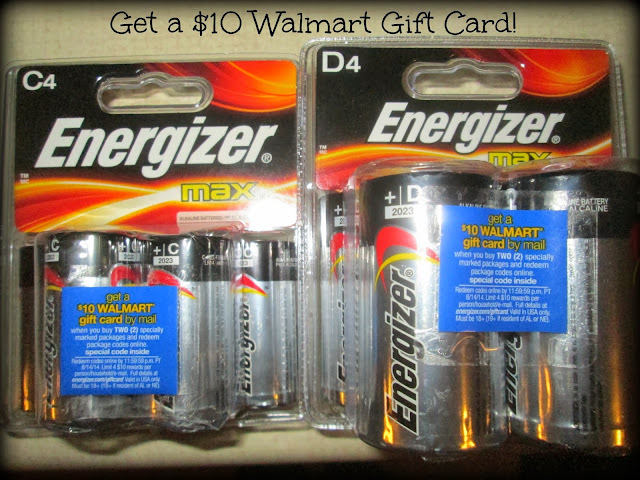 You know you ALWAYS need batteries, so why not get a $10 Walmart gift card while you are at it - it ends up paying for itself that way! And don't forget to use the $1.00 off coupon for MAX AA 8-pack or larger to save even MORE, either from Walmart.com or from Coupon.com!